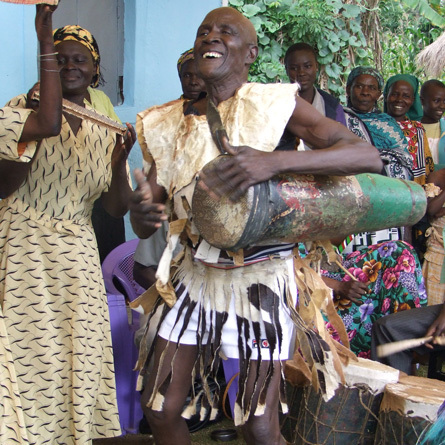 Ogoya Nengo was born Anastasia Oluoch in the late 1930’s, at a small village called Magoya, near the shores of Lake Victoria, of the Nilotic Luo tribe. 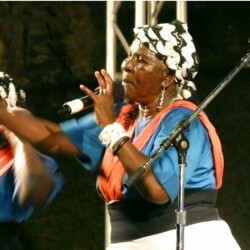 Born to a family of singers and orators, she soon joined their trade and practice as social messengers and commentators, commonly referred to by the locals as Dodo singers. By age 12, Anastasia had realized much acclaim in her society and graced many important functions including weddings, funerals, and village gatherings. As the last born in a family of seven who were all performers, Anastasia emerged as the favorite and was accorded the status of a full time Dodo singer at the age of 13, and named Ogoya Nengo which means ‘The Priced One’. Ogoya and her sister Nyagor became the rave of their time, criss-crossing the region with their music, singing to great chiefs, warriors and even colonial officers and missionaries who became enraptured by their talent. 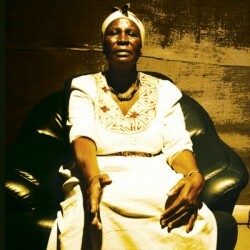 Ogoya Nengo’s music is characterized by her powerful, passionate and compelling voice, backed by traditional drums and percussions. Her music is as timeless as it is mystical. 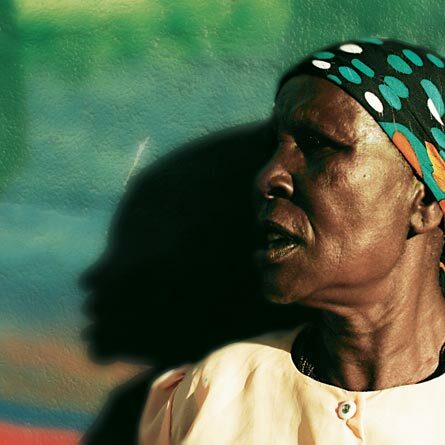 At over 65 years, Ogoya is a legendary Kenyan folk artiste who has had an immense career spanning three decades. However, due to limited resources her music has remained in her region, and many people in Africa have not had the pleasure of hearing and internalizing this amazing artiste. 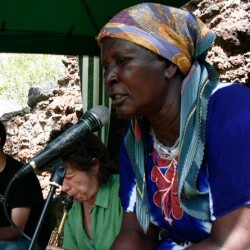 It was with the objective of capturing and eternalizing Ogoya’s music that Ketebul Music Director and Music Promoter, Tabu Osusa went right into the village of Rang’ala to find Ogoya Nengo and her current team of Margaret Arango, Julianne Akoth, Wilfrida Anyango and Pelisse Achieng’ and brought them to his studio, under producers Gabriel Omondi, Jesse Bukindu and Steve Kivutia, to realise this amazing recording of the raw, authentic, passionately intense musicality of the legendary Luo diva, Ogoya Nengo. After a week of rehearsal at Alliance Francaise with her 8 piece band, Ogoya Nengo finally jetted into Zanzibar on the 9th of February. 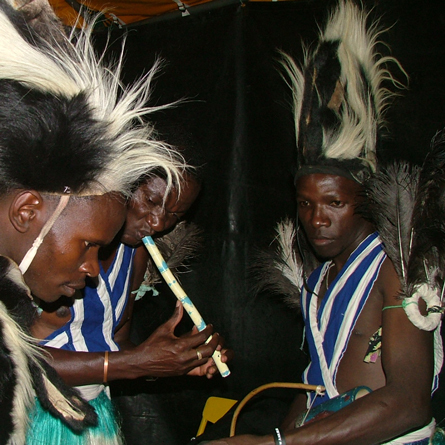 Despite the high temperatures that they were not accustomed to, the group was in high spirits rearing to get on stage and give a dose of Dodo and Ohangla Music. The following morning, the group which comprised of Ogoya Nengo on lead vocals, Olith Ratego, Margaret Ondiege Asin and Wilfrida Anyango on support vocals, Joseph Oloo aka Maumbo on ohangla, Boaz Aketch on Orutu, George Achieng’ on drums, Tobias Onyango on traditional drums and Joseph Ojung’a on the oporo (horn), were up bright and early and ready for their scheduled soundcheck at Ngome Kongwe (the Old Fort) in Stonetown, the venue of Sauti za Busara Festival 2012. 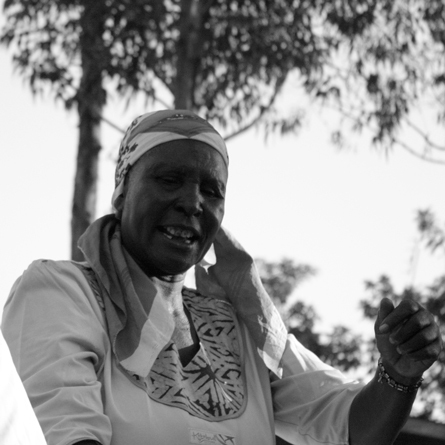 Fast forward to showtime later that evening at 8.20pm, Ogoya Nengo’s powerful vocals reverberated accross the fort’s walls, to the delight and applause from the crowd after each and every song. 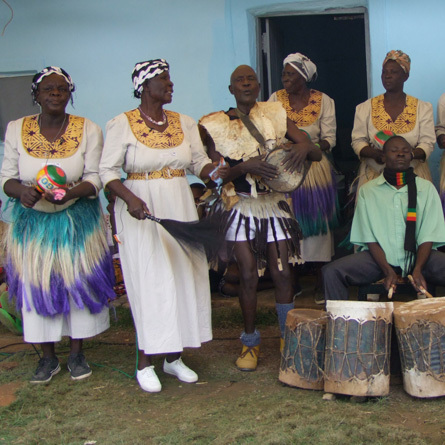 At one point, Camirata Group from Northern Sudan who had peformed the previous night, were so impressed by Ogoya Nengo’s performance that they jumped on stage and danced along with Ogoya Nengo. At the end of her set, Ogoya walked off the stage to another roar of applause from the audience. Ogoya Nengo had a day to explore and discover Zanzibar before taking her flight back to Nairobi on the 12th of February. 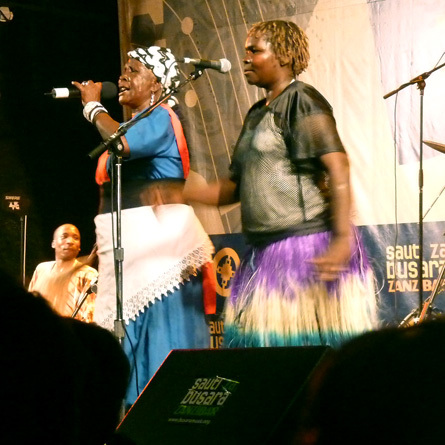 Ogoya Nengo, the matriach of Ketebul Music will be gracing the stage at Ngome Kongwe in Stone Town, Zanzibar during the Sauti za Busara Festival. Ogoya who is no stranger to performing at international stages will be taking the stage on the 10th of February accompanied by her long time collaborators Margaret Asin, Wilfrida Owit and Olith Ratego and a 6piece band which will include famed kenge Kenge orutu player, George Achieng’ and Ohangla drum maestro Maumbo. She will perform and showcase music from her debut studio CD titled Matatu, which features songs done in the dodo style from the lake region of Kenya. You can catch up with Ogoya and her band on the 10th of February from 8.20pm. 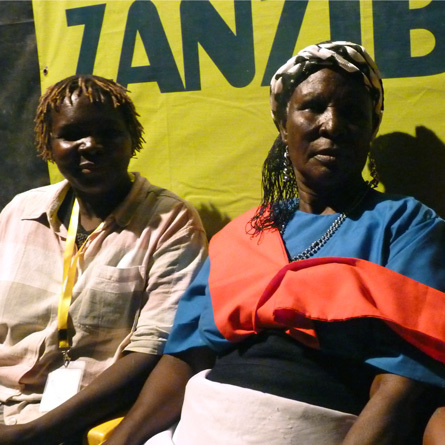 The Standard newspaper recently featured a story on Ogoya Nengo in their Eve Woman magaazine.